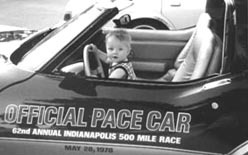 Mikayla looks surprised that Grandpa and Grandma drove up in a 2003 50th Anniversary coupe. Grandpa and Grandma are members of Cedar Rapids Corvette Club in the West Region. Kaytlynn can't wait for the covers to come off of Grandpa's Vettes every spring! Her favorite is the '57! Her Grandpa is a member of Corvette Coventry of SW Michigan in the Michigan Region. Johnny has always loved Basketball but now that he has graduated from FCOA and has a driver's license he hopes to drive...and maybe race...a Corvette. Ashley has also graduated from FCOA and is looking forward to graduating from High School in 2005. She has been very involved in the sport of Cheerleading and is a Gymnastics and Cheerleading Instructor and Coach. Their Grandparents, Jim and Joan, are members of the Northern Illinois Corvette Club in the Midwest Region. 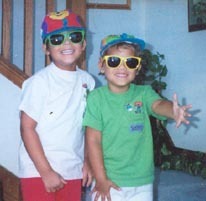 Erik and Karl became members of FCOA while they were living in Guam. Their Mom is a Chief in the Navy and they do get around but getting around in one of Grandpa & Grammy's Corvettes is just way too cool! Grandpa and Grammy, Jim and Joan, are members of the Northern Illinois Corvette Club in the Midwest Region. 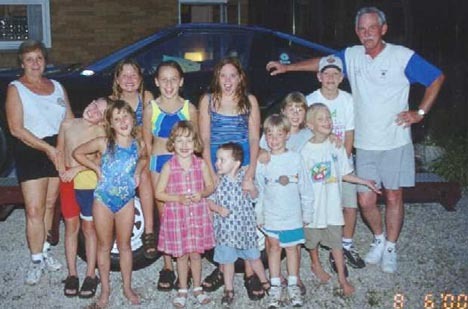 Pictured here with some of their Grandkids are Peg and Bill from the Tiretown Corvette Club in the East Ohio Region. All of the Kids are FCOA Kids !! Kaitlyn (on the right) takes a ride with her Cousin Mikayla (FCOA 0763) in a bright pink Vette! 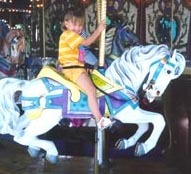 Kaitlyn's family was visiting from Switzerland at the time of this joy ride but have now moved back to the USA. Their Grandparents, Bob & Diane, are members of Cedar Rapids Corvette Club in the West Region. 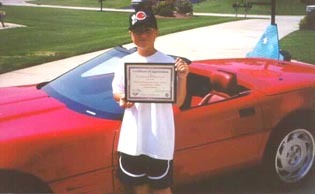 Dan is holding the certificate he received when he was picked to start a black 2001 Z06 at the Corvette Assembly Plant. Dan's parents are members of Badger State Vettes in the Midwest Region. 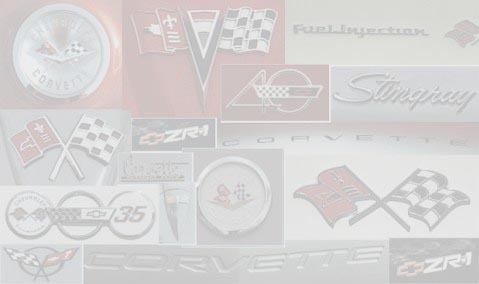 Dan is really a Corvette kid ~ he knows an unbelievable amount of "stuff" about Vettes of all years. Western Michigan & Corvette Coventry of SW Michigan.